Tim Mazaika of Hamburg was named the 2018 Berks County Outdoor Sports Person of the Year, last night, at Virginville Grange during the annual banquet of the Federated Sportsmen’s Clubs of Berks County. The award was presented by A Great Day Outdoors radio, Sundays, 7 a.m., on WEEU-AM830 in Reading and by the Berks Federated Sportsmen’s Clubs. The key to eligibility for the award is volunteerism that furthers Berks County’s outdoor heritage. Mazaika has spearheaded a volunteer program to maintain the park and shoreline of Kaercher Creek Reservoir near Hamburg. 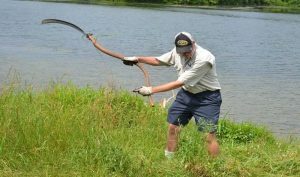 The property is owned by the Pennsylvania Fish and Boat Commission and for many years the park was leased and maintained by Berks County. When the county did not renew its lease because of legal environmental (battery casings) issues, the property was no longer maintained. After many years of going it alone, in 2017 Mazaika established a fund raising campaign and developed a group of volunteers to continue maintaining the property. The organization he created has a Facebook page titled “Friends of Kaercher Creek Park” where donations and volunteer inquirers may be made.